I teach students of all ages and I often have calls from people asking if they’re too old to learn drums. The answer is you’re never too old as long as you can move all four limbs!I am currently teaching students from age seven to seventy seven! and from novice to advanced. As far as younger students go from experience I’ve found that children under the age of seven don’t generally respond well to lessons due in part to the physical challenges of reaching the foot pedals and sometimes difficulty in focusing on one thing for more than a couple of minutes. As always there are exceptions and if you’re child is enthusiastic about wanting to try then I’m happy for them to come along and give it a go. Children and adults with special needs are also welcome. Grade 8 Trinity College London Drum Kit. Accreditation from The Music Teachers’ Association of NSW. Lessons take place at my home studio in Avalon on Sydney’s Northern Beaches. Click here to see a map. Home visits can sometimes be organized at an extra charge. Please contact me to check. This depends on the age and experience of the student. 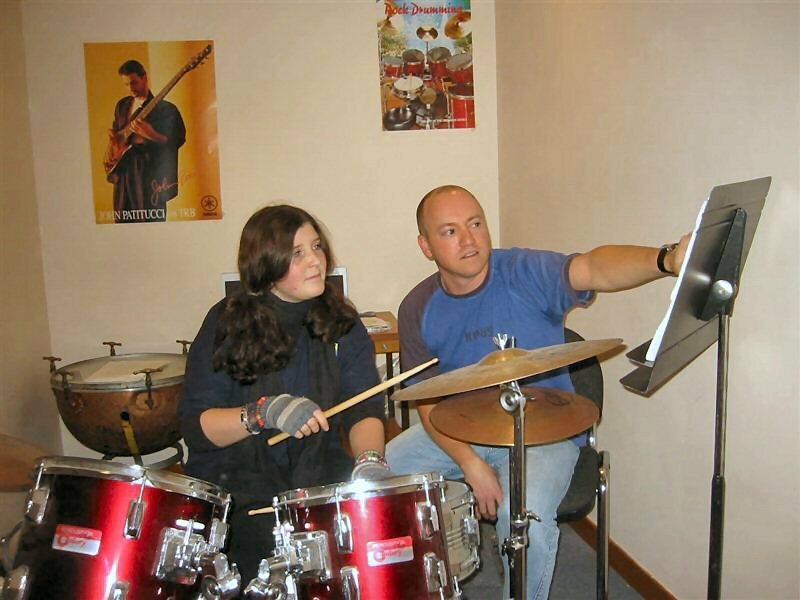 Typically in the first few weeks of lessons for a beginner the focus tends to be on developing correct technique (grip, foot pedals, striking the drum correctly) and posture, understanding rhythm and simple notation followed by learning some basic grooves (rock, pop, jazz) and sticking patterns (Rudiments). School band and exam pieces will also be covered if required. As a student’s skill level grows then the lessons become more tailored to the individuals interest and areas which require most work. All styles will be covered, with rock, jazz and latin independence being worked on, as well as applying the rudiments and learning to interpret a drum chart, playing with a click track, understanding song structure and developing a musical and sensitive approach to drumming, which is always popular with other musicians! Of course learning favourite songs and just having fun with the instrument is important too. How much practice will I need? For under 12’s I recommend 15-30 minutes focused practice most days, by focused I mean practicing things we have been working on in the lessons rather than just having a bash, this is encouraged but should be done separately from practice time. For teens and adults, a minimum of 30 minutes and up to 2hrs per day, or more, depending on the levels of motivation and time available. It’s important to practice regularly rather than long cramming sessions for maximum development. For more on how to practice please see my practice tips page. This is probably the most common question I get asked and one to which I don’t have a clear answer. Everyone has different levels of natural ability, and a technique that one person might find difficult, another may find fairly simple to master, so this student will progress quicker, but as a very general guide I would expect most beginner students to be up and running with good basic technique (grip, posture etc.) and understanding rhythm and basic notation and playing some simple grooves such as basic rock, pop and jazz within the first six week period of lessons. Please see my separate prices page. 30 minutes for under 12′s and 45 minutes for over 12′s and adults. This is just a guide and students are free to choose either of these lengths that they prefer. My timetables work on a weekly basis though fortnightly lessons can be organized as well. Casual lessons can be organised for adults who can’t get locked into a regular time each week. No equipment is necessary for the first lesson. Within the first month a student should have a set of sticks(5a), a practice pad, a folder and notepad. I recommend having access to a full drum kit (electronic or acoustic) to practice within the first 3 months of lessons for maximum development. All sheet music is provided. All sheet music and audio and video files are delivered electronically so access to a computer is necessary. Click here for a guide on managing your digital sheet music and audio files. If a student decides to do examinations then the course book for this will need to be purchased separately. As long as you feel you are getting the benefits from them and they are helping you progress towards your musical goals. Some students I have taught for years and others come for just a couple of months to get them started. Do I prepare students for examinations? Yes. I guide my students towards taking Trinity College Rock And Pop examinations as I’ve found this to be the most rewarding of all examination courses available. Examinations take place in November yearly. These are of course optional. AMEB exams can also be taught and enrolled for. Is it ok if I sit in on my child's lesson? It’s ok to sit in on your child’s lesson for the first time to reassure them or occasionally to check on progress or listen to a prepared piece. But from experience I believe it’s not a good idea to sit in on the lessons on a regular basis as it can hinder building a strong learning relationship between the child and teacher. When a parent is present sometimes the child can look to the parent for guidance rather than the teacher. Some children can also feel under pressure to perform when a parent is present as they want to please and show their abilities,sometimes when a child makes mistakes or can’t grasp something while a parent is watching they may tend to get more upset or lose confidence. I’ve found one on one lessons between teacher and student always produces the best results. Yes,always kept current. WWCC number WWC0434667E. I only ever use the best equipment to teach from, you won’t find any beat up drum kits here as in some other teaching premises. Currently I’m using a state of the art ATV Electronic drum kit. These are simply the best electronic drums you can buy in my opinion, very responsive and they sound fantastic, a real pleasure to play. All lessons are conducted using iPad Pro,all sheet music and other media can then be shared instantly during the lesson. We can also slow songs down to make learning easier and record and email audio and video samples for helping those who aren’t yet proficient at reading notation. This new technology has revolutionised the way I teach and has greatly benefited me and my students.